It was New Years Eve in the Minneapolis airport, when my flight was canceled. Knowing I was going to be spending the next thirteen hours in the terminal, I stopped by the book store. Last semester’s finals still fresh in my mind, I figured I would get a book with little substance to pass the time. 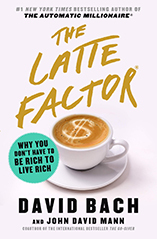 There on the bestseller rack was David’s recent book, “Automatic Millionaire”. Flipping through the pages, I figured it might be informative, but mostly, I wanted to find out what was behind this, yet another, get rich quick scheme. Two hours later I was shocked. Being a student, I have never spent much time thinking about my future, but by the end of this book I realized that with little impact to my small income, I could begin to set my self up for the rest of my financial future. Now, three months later, I have over 300 dollars in savings and set up a retirement plan, all automatically deducted from my paycheck before I get it. At this rate, I will have a solid financial foundation to build on when I graduate.